In 2010 I was asked to give a talk on Dorothy as part of the Fife Local Heroes and Dunfermline Diamonds celebration of famous people born in those areas. I happily agreed and it took place in the Carnegie Library in the historic centre of Dunfermline, on 13th May 2010. Book lovers will know that this was the first public library in the world and was created by the famous Scottish-born philanthropist Andrew Carnegie who made a fortune in the American steel industry. It was also a venue that Dorothy herself had given a talk in, and in fact one member of the audience was a former library worker who had been nervously delegated to collect her from the railway station and had been so charmed by her easy and relaxed manner that she became a firm fan. Good evening and welcome to this talk about one of Dunfermline’s most notable daughters. 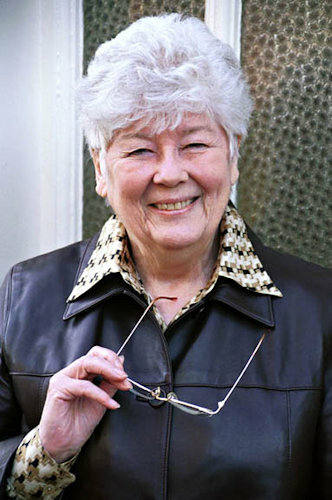 Dorothy Dunnett OBE. Before we get under way, I’d like to ask how many of you have read Dorothy’s books in order to be sure what I can say without spoiling any endings for anyone planning on reading anything? How many have read any of her books? (Most but not all) Has anyone not read Checkmate? Who was Dorothy Dunnett and why is she remembered? Dorothy was one of those people who seem to be good at anything they turn their hands to. You might think that would be enough for most people, but none of that is what most people know her for; she is of course best known as an author of superlative historical fiction – possibly the best ever in that genre. She wrote two large series – the 6 volume Lymond Chronicles and the 8 volume House of Niccolo, and a single volume book on Macbeth – King Hereafter – which may be her finest work. For light relief she also slipped in a series of detective/spy novels. A little about her life. She was the only daughter of Alick and Dorothy Halliday who had met in rather unusual circumstances. He was in hospital in southern England recovering from being wounded during the First World War and his neighbour in the next bed was receiving much more interesting letters than his own relatives seemed able to write. One in particular was the highlight of the week and Alick asked who it was from. It turned out it was from the chap’s teenage niece and was always full of humour, and he took to reading it out. Alick was enchanted and when he was moved to a convalescent hospital near Lanark he asked if it would be alright for him to write to her and they started to correspond. Soon they were writing to each other every day and this led to them getting married some years later and they moved to Dunfermline where Dorothy was born. Alick was a mining and boiler engineer and his work led him to move the family to Edinburgh where Dorothy went to James Gillespie’s School. She was a bright and artistic pupil: she sang soprano in their Gilbert and Sullivan production – which was to remain a lifetime passion – and was Junior Dux, and in normal circumstances would probably have gone on to University, but the war intervened. In 1939 at the age of 16 she applied for a Civil Service job and started at the Scottish Office doing filing and typing while at home her mother taught her shorthand. In those war-time years people were thrust together in the long working hours of war effort, often staying overnight to minimise travel or to continue working, and they made deep and lasting friendships. Alastair found Dorothy a bright and intelligent companion and during off-time he was one of those who taught her table tennis and snooker, and they went for walks, and sang together, and he taught her something of Scottish history, which in those days she knew little about as Gillespie’s apparently didn’t teach much of it at that time. By the time the war was over the unlikely friendship they’d struck up – he was 15 years her senior – had blossomed into love. When he was offered the editorship of the Daily Record, then a serious newspaper, he told her he couldn’t go to Glasgow without her and they were married in Corstorphine Old Parish Church in Edinburgh before honeymooning on the island of Inchcruin in Loch Lomond. Thus started a wonderful life-long partnership that had a very significant effect on Scotland. Dorothy had a deep understanding of trade and business – as a number of her later fellow board members found to their cost – and she was later able to use that knowledge in writing the House of Niccolo series. She developed that understanding from working at the Board of Trade when she and Alastair moved to Glasgow. She produced a yearly survey of the Scottish economy and business as the country tried to get back to normal trading after the war, which became such a meticulously researched source of insight that once she left they stopped producing it. Having been a talented illustrator from an early age she pursued art studies in her spare time, taking classes at Edinburgh School of Art, and Glasgow School of Art and was exhibited in the McClennan Galleries where she had favourable reviews. This led to her taking private commissions and from around 1950 she was a professional portrait painter in parallel with her work. Most of her pictures are in private hands but a couple are on public display – one of Lord Wheatly is in Tam Dalyell’s home, the House of Binns, while perhaps her best work, a portrait of the actor Duncan Macrae in his celebrated role of Jamie the Saxt, which was for many years in the Citizens Theatre in Glasgow and is now in the People’s Palace museum on Glasgow Green. I went to see it just a few weeks ago. In 1955 the Daily Record was taken over and it was clear it would be turned into a tabloid like the Daily Mirror. Alastair was offered the editorship of The Scotsman, and they moved to Edinburgh. Dorothy continued to paint as well as to sculpt, but she was also an avid reader. One day she complained to Alastair that she had run out of good historical fiction – his reply was that she should write some herself. And thus started a legend. She set to to research. And as was her way it became all-consuming. She read all Alastair’s books, she read everything she could find in the library and then the National Library, and then overseas libraries. She studied what original source material she could find. She visited potential scenes in Edinburgh, the Borders and the Highlands, and she started writing copiously. About two years later she handed Alastair a large sheaf of handwritten manuscript and asked if he would have time to read it. He read it in two nights (and that certainly marks him as being a fast reader) and was astonished. What she’d given him was Game of Kings and it was to change historical fiction forever. This is what he wrote about that first reading. It took me two days, or properly two nights running, each time from around midnight to 6 a.m. When it was finished I remember laying my head down on the desk, dazed, triumphant. I was first of all aboundingly glad for her, that the time had been so worth it, and even if nothing were to come after there would be a lifetime satisfaction, for someone like her, in the contentment that it could be done. The style was amazing, the scholarship nimbly knitted in a tale, with personalities historical and fictional, so realised that the whole thing lived and spoke of human dilemmas and contrivance and idealism. Beyond that, I knew for certain that here was a sudden milestone in this kind of writing, and if it got into print it would never stop expanding as people, taking time, would find it was unique and unsurpassed. But they couldn’t find a publisher. Five UK publishers expressed admiration, sometimes sending readers comments which were highly favourable, but all of them seemed to think it was too long. We’re used now to large sagas but in those days most books were much shorter. At this point Alastair’s connections and belief in Dorothy’s writing came into play. He knew Lois Dwight Cole from a number of trips to the USA. Originally it was Pansy O’Hara. You can’t quite imagine Clarke Gable talking passionately to Pansy O’Hara can you? Lois renamed her Scarlett, and the rest is history, for both book and film. So Alastair wrote to Lois – “How would you like to see an astounding manuscript of a story by the wittiest woman in Scotland?” The reply was simply “Send it”. They did and a contract soon followed. It was edited by Cole and published by Putnam in 1961 while she also sold the UK rights to Cassell who published it here the following year. Game of Kings, introduced the hero to end all heroes. Dorothy said later that she got the idea from Ian Fleming, who was a friend of the Dunnetts, who had described his hero James Bond as the “Spy to end all spies”. Dorothy’s hero was Francis Crawford of Lymond, the blond second-son of an influential Scottish family. Lymond was a smash hit. And he’s lasted. A couple of years ago BBC’s Woman’s Hour program ran a poll of the most romantic hero in literature – they expected that someone such as Rochester or Darcy would win and seemed a little non-plussed when Francis Crawford came in ahead of them all. There was another poll in 2005 for the 100 Best Scottish Books and Game of Kings came second only to Lewis Grassic Gibbon’s Sunset Song. Lymond is a fascinating character in a book and series which is full of them. He has a rapier wit and a scathing tongue when necessary. He explains nothing to anyone and takes responsibility for everything and everyone. He has a highly developed sense of morality but it’s completely his own. He’s a tortured genius, a natural leader of men from a young age, a wonderful musician, a natural linguist. He’s been betrayed in love at 16 by the second most powerful woman in England after being captured in battle. He’s been a galley slave and a mercenary. And every political faction in Europe wants to have him working for them. When we first meet him we’re not even sure he is a hero – he’s a renegade with a price on his head for apparent treason in selling secrets to the English and blowing up a convent, (which incidentally killed his younger sister Eloise). He sets fire to his mother’s house and taunts his brother. Dorothy teases us, misleads us with an episode featuring amnesia, and that coupled with her first-time writer’s somewhat extravagant style makes the first 100 pages a little hard going. Then we catch a glimpse of her humour in the shape of a Spanish mercenary captain who turns out to be Lymond in disguise and everything falls into place. Most people who get that far fall in love with both hero and writer and an addiction is born. We see Dorothy inserting her characters seamlessly into the real events of history in a way that had never been attempted before and which requires detailed research of a sort unheard of outside academia. We follow Lymond’s adventures through Scotland and England, most of Europe and the Mediterranean, North Africa and Turkey, to Russia and back across the North Sea to Britain and France before his return home. The series is exhilarating in scope and pace. And we see a devilishly complex romance bubbling below the surface that seems to be doomed by his growing suicidal despair. We see tragic deaths of beloved characters, a living chess game where death awaits the loser and any pieces taken during play. We see unlikely friendships formed and lost. A family is split apart and its secrets threaten to destroy it, nations pitted against nation, sea battles, land battles, political intrigue and religious division. We see two very different villains – one an apparently saintly man and one a power hungry woman. It is a world that lives and breaths – that we step into and experience rather than merely read about. With all Dorothy’s painterly observations converted to descriptions that are sometimes rich and lavish and sometimes incisively direct. And the series has one of the most dramatic finales in literature where we believe the hero has been killed. There are many stories about that ending. One woman, who I know personally, was reading Checkmate on a train, and having reached the death scene she threw the book down the carriage is despair. It lay there for a few minutes until another passenger, observing the title, picked it up and returned it, saying simply “I think you should finish the book”. Thankfully she did! Another lady, having reached the same point, wrote to Dorothy expressing her disgust at the hero’s death and vowed never to read another of her books. But she didn’t include her address so Dorothy was unable to write and advise her to continue to the end. She never found out if the lady ever discovered the truth. I’ll go into more detail about her later writing in a moment but none of what I’ve just said gets to the essence of Dorothy Dunnett. I was lucky to know her and work with her for the last 6 years of her life, and I can say without any hesitation that she was quite simply the most intelligent and charming person I’ve ever met or ever hope to meet. I remember the first time I met her in the Mail Order Dept of James Thins – the Edinburgh bookshop where I worked. Immediately you could see the bright and almost mischievous eyes, the laughing smile, the eternal youth that an enquiring mind possesses. At that point I decided I had to read her books, though at the time I read hardly any fiction. To watch her in public, at book readings or conferences was to watch a consummate professional certainly, but also one who also cared very much about the people she was meeting. She could remember people she’d met or corresponded with years earlier. She could hold an audience spellbound with a light and mellifluous voice, and a sparkling wit, and she knew how to make an entrance. She was quite small but she could sweep into a room and had immaculate dress sense. Talking to her in private, as I was fortunate enough to do over a few glasses of malt whisky on a number of occasions, was a bit like riding three or four rollercoasters at once. I remember feelings of awe, exhilaration, and sheer happiness. Conversation was easily begun but then you had to keep up with it! Ideas went flashing past, with connections being made, theories formulated, tested, discarded, replaced with others. And before you were aware of it her mind had danced off to other thoughts; constantly curious, wanting your insights and views however incomplete they might be. And always happy to offer advice and help where needed. I wish I could remember half of what we discussed but I can’t – partly no doubt due to the generous measures of whisky – we both had a deep love of Talisker – but as much because there was so much information to process and I just couldn’t cope with it all. But each time I came away feeling energised, and intellectually enriched – a bit like Philippa in Lyon after the chase through the Traboules, saying ‘Francis you fool, this is what you should be’. The remarkable thing for someone so intelligent, and also perhaps her most endearing quality, was that she was totally unassuming and modest. Just as she did in her writing, she credited those she spoke to with just as much understanding and insight as she had herself, and in my experience that is a very rare attribute. I only met Alastair a couple of times before he died at the age of 89, but he was a remarkable man, and even then his eyes still twinkled. And together with his remarkable wife they did great things. Using the power of his connections and those of the Scotsman newspaper he was able to bring together people who mattered and to influence them. They used to throw after-the-show parties during the Edinburgh Festival which became legendary and attracted all the best actors and musicians plus men of influence and power. Connections were made, ideas discussed. The public bodies on which they both served were brought together in ways that made a difference. Scottish Opera was created in their house, Scottish Ballet was helped into existence. Later as chairman of Thomson North Sea Oil Alastair continued this work. Men such as Paul Getty and Armand Hammer, two of the richest men in the world, were guests at their house. Scotland would have been a poorer place without their influence. The Lymond Chronicles set new standards for historical fiction and made Dorothy a world-famous name, particularly in America where this brand of writing drew massive attention. When it was finished her publishers wanted to know what was next and asked her to do a single volume book on a major Scottish historical figure such as Bonnie Prince Charlie or Mary Queen of Scots – the usual suspects. That wasn’t for her – plenty of people had written about them. She suggested one of the most famous Scots in history – Macbeth, though she knew little about him other than he was much maligned by Shakespeare. They agreed and a provisional publication date was set for 2 years hence. So she started the research, which was difficult because there is little original source material from the 11th century and it is widely scattered across Europe . There are the Icelandic Sagas but they are not always reliable for historical accuracy. During this initial research she became aware of Thorfinn the Mighty, Earl of Orkney, considered by historians to be a cousin of Macbeth or possibly a step-brother, who seemed to crop up in nearly every reference. She dug deeper, and gradually she formed a theory, which she believed she could prove – that Macbeth and Thorfinn were one and the same man – that the separation was because in Christian circles he was known as Macbeth and in Nordic circles Thorfinn. Research went on and on, the publication date long past and not a word written, with the publisher becoming increasingly restless, until eventually she had to decide whether to write a factual history following yet more research or to write the fictional book she’d contracted to. She chose the latter and the result is King Hereafter. It’s a vast book ranging from Norway and Orkney, the emerging Kingdom of Alba, the England of Canute (or Knut), and all the way to Rome, for Macbeth made a pilgrimage there. As with the Lymond Chronicles the thing that stands out for me is the interconnectedness of the history across Europe. Unlike the history books we learned from at school, where we see individual countries and what was happening to them in near isolation, Dorothy had the gift of being able to explain the connections and how they affected the development of the whole continent. The family trees that were necessary to understand the relationships across Europe were written on a piece of wallpaper 25 feet long. It’s now in the Dunnett Archive in the National Library. King Hereafter took 7 years to complete. It gives us a dramatised picture of life in those times in a way that no other book has ever done. But it remains true to overall history and thus the ending is perhaps one of the most heart-rending in literature. I know many enthusiasts who read the whole book except for the last chapter which they cannot bear to finish. One of Dorothy’s greatest attributes was her sense of humour, but she found that some of her observations and jokes couldn’t be fitted into the historical narratives because they depended on some current aspect of society or politics. So for light relief in between writing Lymond – and heaven knows where she found the time – she wrote a series of books about a spy called by the unlikely name of Johnson Johnson. He wears bifocal glasses which conveniently hide his emotions and his cover is that of a professional portrait painter! He spends a lot of time on his yacht, which is called Dolly, and the books are narrated by a series of young women, who in the common slang of the time can be considered birds – dollybirds – which gives rise to the titles which are such as Dolly and the Singing Bird, Dolly and the Doctor Bird, Dolly and the Bird of Paradise. While very much of their time and nothing like as deep as the historical books, they are interesting reading and full of the light humour that she wanted to express. In America they had different titles because at that time the President was Lyndon B Johnson and his wife was called Ladybird Johnson, so the US publisher, fearing offence to the First Lady, insisted on the change of title. Given that one of them was called Dolly and the Cookie Bird you can perhaps understand their concern. Just to further confuse matter some of the books were later republished under yet different names. But back to the historical books. And so it came time, after King Hereafter, to decide what to write next. Of course all the fans wanted more Lymond, but Dorothy felt she had exhausted the time slot into which he had been placed and in any case wanted to explore new facets of the period. This was at a time when Britain had swung to the Right with Margaret Thatcher and yuppies and city wheeler-dealers were all the rage. Taking a cue from this Dorothy looked at a time period a century earlier than Lymond, when the Renaissance was just beginning to affect Europe and the newly developed Double entry book-keeping systems using the quite recently imported Arabic number system were revolutionising commerce and trade. Banking in particular was becoming an important aspect of business. She wanted to explore these developments and look at how for the first time it was possible for someone with the right skills to move up from a lowly position in society to a position of power – just as was apparently happening in the London financial markets of the 1980. And with an eye on the readers clamouring for Lymond she devised a cunning plan. Once again we see the first book Niccolo Rising continue for some time before we discover who the hero really is, and this time it’s something of a surprise. Instead of the beautiful blond Scottish nobleman, athletic and wonderfully educated, we have a dye-yard apprentice in Bruges called Claes, a clumsy buffoon who gets himself into trouble constantly, has no fighting skills, and who smells of the urine used to fix the dye to the cloth. Surely he can’t be her new hero? Only gradually do we become aware that all is not what it appears. That the young man has hidden talents, particularly with numbers and codes, that he has an analytical mind which can see possibilities and connections that are invisible to most. That as an orphan he would have had no chance of rising to prominence in an earlier time, but now there are those who can see how his skills might be used. This starts another epic adventure, with many parallels to the first story but containing elements which are often turned on their heads. There is a beautiful blond nobleman (who funnily enough is Scottish) but he’s foolish and vain and generally a bad sort. There are characters who seem to echo some of those from the first series but not quite. There is action in the Mediterranean, but on Rhodes rather than Malta, and in Byzantine lands, but Trebizond rather than Istanbul. We have another villain, a gross and ruthless individual who turns out to be the Scotsman’s father and seems connected in some other ways. The politics are fascinating. France is not yet the power she will become, the Empire left from the Holy Roman Empire still holds sway in many disconnected parts of Europe. There is war in the states that will become Italy. We see the developing sugar trade on Madeira and Cyprus. We see the first connections with the Africa that lies beyond the Sahara. We see the quickly developing young man coming into a great power that makes him attractive to crowned heads in many countries but then we see him at war with his own wife – for possession of his son and for success in trade. The House of Niccolo is in many ways more complex than the Lymond Chronicles, the themes more obscure, the moral focus less certain. But it’s a story of growth and development, and slowly we begin to see where it is developing to, where these echoes are leading us. And it is back to Scotland. For what Dorothy had conceived, long before David Lynch’s films made the term popular, was a Prequel – a Prequel to Lymond. Niccolo has scores to settle in Scotland but also has ties there, of his own and through a Bruges nobleman called Anselm Adorne who becomes a trusted ambassador and advisor, and through his niece Kathi, who has a close bond to Niccolo. The really amazing thing is that fact proved stranger than fiction. Dorothy originally wrote Kathi as Adorne’s daughter, but then discovered a real niece. A niece who she also discovered through deep research, had married a Crawford!! It required a bit of rewriting but it was an astonishing connection. Every Dunnett reader has favourite quotes from the books. Let’s look at a few. “They entered Loch Bracadale with the sunrise, rose-coloured oars laying darkling folds on the rose-tinted pool of the fjord. A dusting of guillemots, asleep on the water, roused and dived with almost no sound, leaving pink and verdigris rings on the surface. A charcoal rock needled with cormorants became suddenly bare, and from the shore came the scalloped cry of an oyster-catcher, joined after a moment by others, Then the longships slid past, and the sounds died away. With no sound at all, but with a glory that bludgeoned the senses, the furnace doors were thrown finally open, and the spires and pinnacles of the mountains of Skye stood suddenly stark before them, against mighty rivers of scarlet and brass. Some readers prefer Lymond, some Niccolo. Some say that it depends on which series you read first – others deny it. Few readers once enmeshed in either series are ever the same again. They used to write to Dorothy in their hundreds, asking questions, telling her they had been to a scene in one of the books (and discovered it exactly as she’d described it), how they had developed an absorbing interest in Renaissance history, or cloth-making, or glass-making, or visited the Loire Valley or Venice or Istanbul. Telling her they’d named their sons and daughters Francis or Philippa, or their dogs, or their racehorses. And she, busy with researching and writing and being on committees wrote back to them all, until eventually she had to get a secretary to help deal with the flood of correspondence. There used to be a newsletter that was produced, initially in America as a collection of typewritten pages, where readers wrote to each other comparing theories about the books – this was when the House of Niccolo was still in its early volumes. Conventions, which Americans love, were organised here in Scotland and over in the USA, and Dorothy of course attended them. Then the internet arrived and some inspired person had the idea of an internet email discussion group. How many readers have developed skills in computing due to the overriding need to discuss Dunnett! It was not long after this that I came on the scene. I was working for James Thin in Edinburgh. I’d been in the Scientific Dept specialising in the computer books for some years and being naturally technical took close interest in the computer stock control and ordering systems that Thins had pioneered in the book trade. I eventually became the Network Manager and pushed for a connection to this new-fangled thing called the internet. Not long after I’d set it up our Mail Order dept asked me if I could reply to a lady who had sent a letter asking for urgent information about one of our best selling authors – Dorothy – for we had a mailing list of around 100 overseas readers who wanted the latest books as soon as they were available, which was usually 6 months before their publication in America. She had included her email address in the letter. So I sent an email, and what happened next was remarkable. She replied, excited beyond measure that we were on the internet, and she told her friends on Dunnettwork, the original discussion group. And they started to write to me. Now in those days I had a pretty dim view of historical fiction – most of it I thought was little more than over-romantic tosh – but it was soon clear that the sort of people writing to me were not likely to be fans of that sort of stuff. These were educated people, and yet their enthusiasm was palpable. The questions that started to come through were not just about the availability of the books but about academic histories of obscure parts of the world. And pretty soon I was being asked about the content of the books, of which I knew nothing. Then I met Dorothy for the first time and I knew I had to read them. A decision I’ve never regretted. The next step for Thins was a web site, which I started to build. Looking for a unique selling point there was one very obvious choice. The new Dunnett pages soon became the most popular on that very early site. Dorothy was very helpful providing facts and later photos for me to use. And later we collaborated on a new feature which allowed readers to send in questions that she would answer as time allowed – thus taking some of the pressure off her in her correspondence with them. I always looked forward to reading her answers, for she seldom gave a direct one, preferring to show the readers how to think about the scene or character in order to discover the truth or the intention. But she managed it in a way that worked on a number of different levels depending on the reader’s experience and knowledge and with a light touch. That was also how she handled questions after giving book readings or signing – a simple question was given as much attention as a complex one and everyone came away satisfied. As the internet developed more discussion groups sprang up – Marzipan was initially run by the same enthusiasts who compiled the newsletter which was called Marzipan and Kisses from a phrase in Queens’ Play. There are now offshoots which do group readings of the books and there has developed a worldwide network of friends who are bound together by their shared interest not just in the books but in the many fascinating aspects of history, geography, trade and craftsmanship which the books introduced them to. After the publication of Gemini Dorothy decided to wind up the Dunnett Foundation which had taken over the production of Whispering Gallery – the UK name for the magazine which sprang out of that early newsletter – and set up the Dorothy Dunnett Readers’ Association (DDRA), and I was invited to join the steering committee which set it up and subsequently ran it. I served on that for 8 years including two as chairman until stepping down this year due to pressure of running a new business. The DDRA also runs weekend gatherings in Edinburgh in April every year and supports other enthusiasts who run day events in Oxford and Essex amongst others and international gatherings in places such as Dublin, Malta, New Orleans, and this year there will be one in Paris with Istanbul planned for 2012. This is the literary and social legacy that Dorothy has left her readers. International friendship and inspiration for studies and interests that have changed peoples lives, enriched them beyond measure. The books themselves will surely last forever as long as people enjoy complex and challenging plots and exciting and engaging characters. I firmly believe that they deserve to become classics and be studied in the way that Scott and Stevenson and our other great authors are. That is why Dorothy Dunnett deserves to be remembered and why Dunfermline and Fife and Scotland should be proud of her and her achievements. There followed a number of questions on various topics and some of the audience recalled talks and readings they had seen Dorothy give. I was then able to chat with some of them over drinks and show them copies of Whispering Gallery before a very pleasant evening drew to a close. I would like to thank everyone involved at Fife and Dunfermline councils and the Carnegie Library, and in particular to Margaret Rhind for her assistance on the night. It’s very good to know that Dorothy’s memory is being kept alive in her native town.